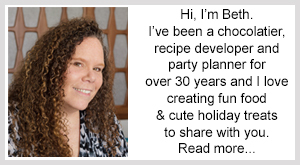 May 1, 2014 By This post may contain affiliate links. 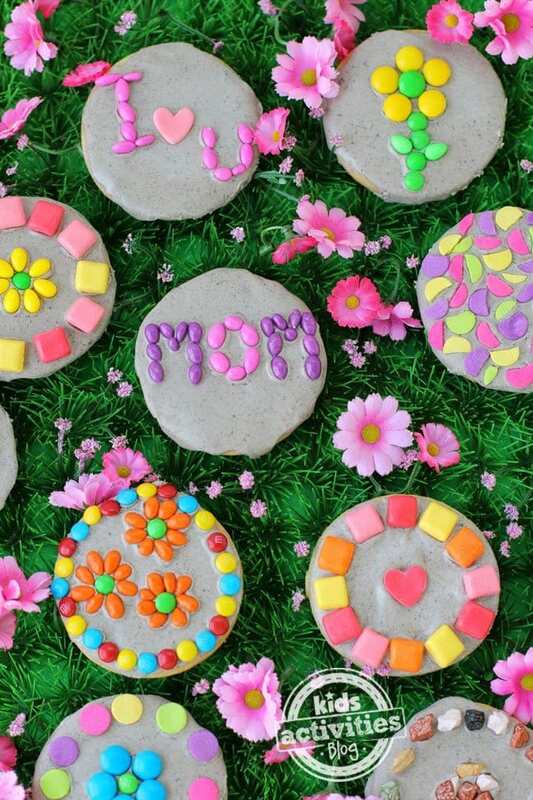 Transform a jumbo cookie into a Sugar Cookie Garden Stone by frosting it with cookies ‘n cream frosting and decorating it with candy. 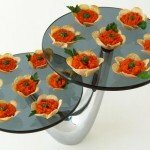 You can personalize it and give as a Mother’s Day gift. This Sugar Cookie Garden Stone couldn’t have been easier to make and believe me I needed something to go well in my kitchen this week. For the past two days I have worked in total frustration. My friends and I got together to try our hands at baking macarons, after having taken a class on the subject. Sadly, our teacher didn’t have much luck making perfect macarons during our class and didn’t give us much confidence in doing them ourselves, but we were determined. Unfortunately, her recipe just didn’t work. Try as we might, our cookies either flattened out, cracked, or stuck to the paper. We tried a few other recipes and watched lots of videos and still couldn’t get them to turn out perfectly. We got less than 2 dozen decent looking macarons and many, many, more scraps. If you are an expert macaron maker, will you come to my house and teach me how to make them? Please! 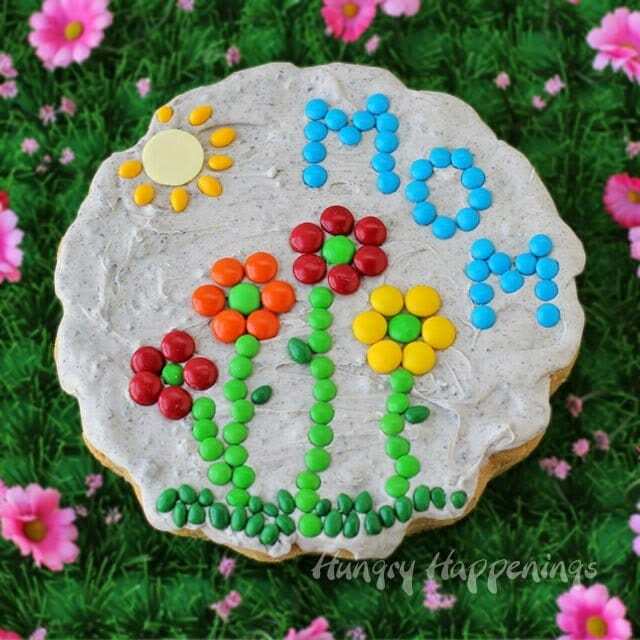 The worst thing about all of our failed attempts was that we were all hoping to pack up some of the pretty little cookies to give to our moms on Mother Day. That wasn’t happening, so I had to come up with something quick and easy to make, instead. My mom loves sugar cookies so I decided to recreate an idea that I had done a few years ago, but use a sugar cookie instead. 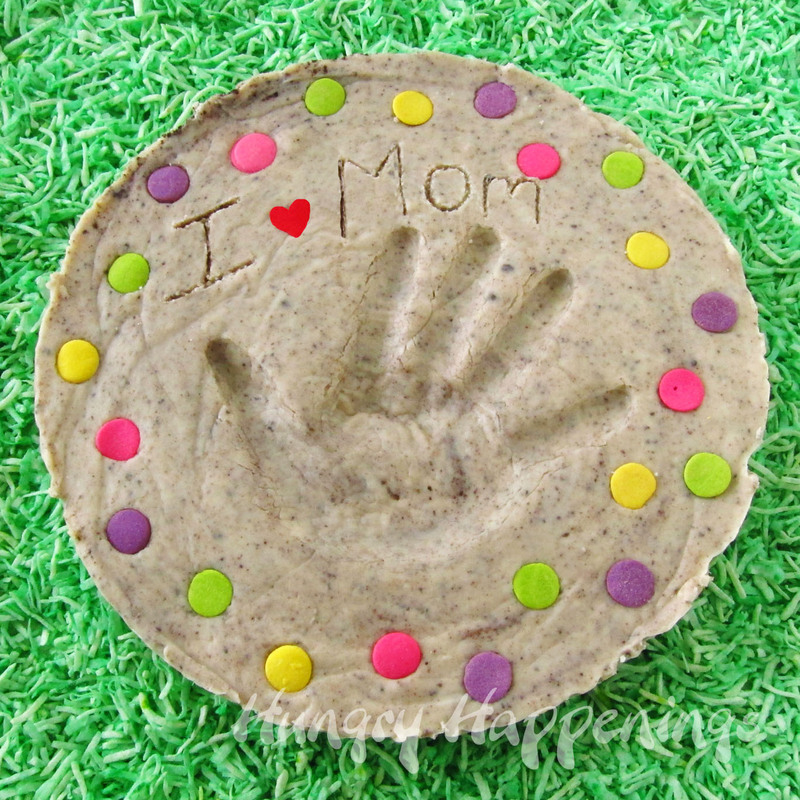 Do you remember this Cookies ‘n Cream Fudge Garden Stone with a kid’s handprint in the center? 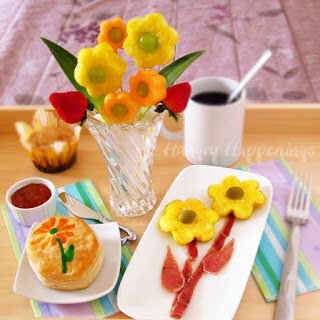 I made it for Mother’s Day back in 2012. 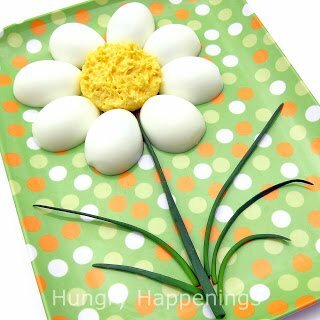 I really love the concept of personalizing an edible garden stone to give to mom on her special day. 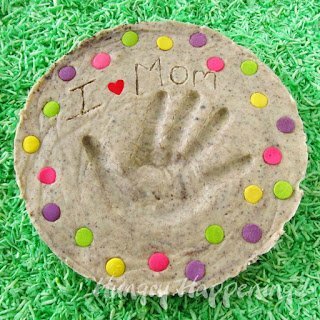 My original stone was made of fudge which was perfect for adding a hand print. The cookie stone would be a bit more firm, so I decided to just decorate it with candy. 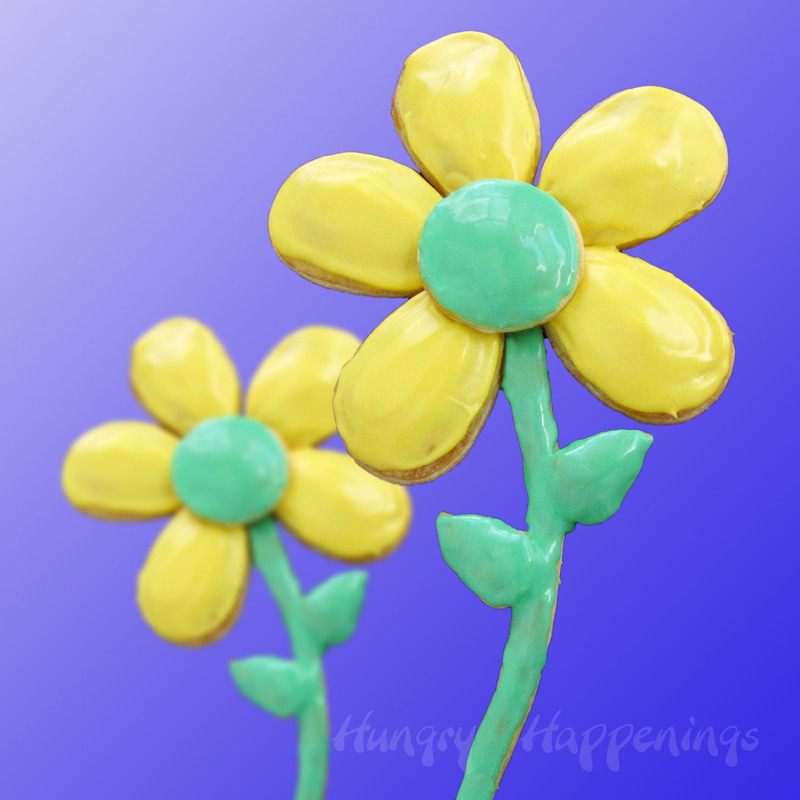 The big stone turned out so great, that I decided to make a bunch of smaller Garden Stone Cookies too and shared them on Kids Activities Blog. 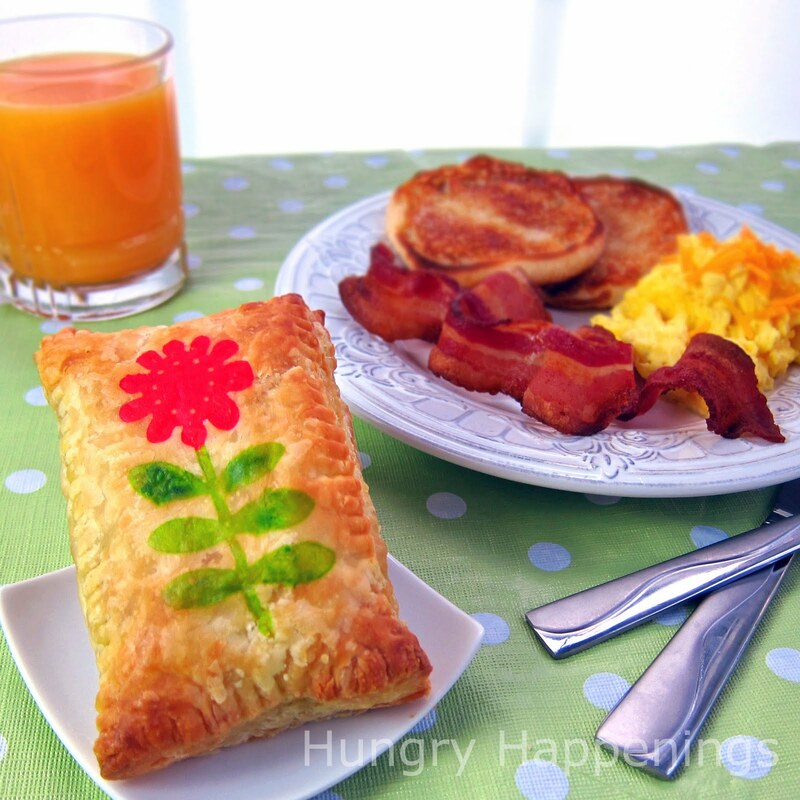 As you can see, there are so many fun designs your can create on your own edible garden stones. 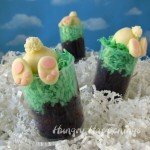 Use any kind of candy you like to make your own designs. 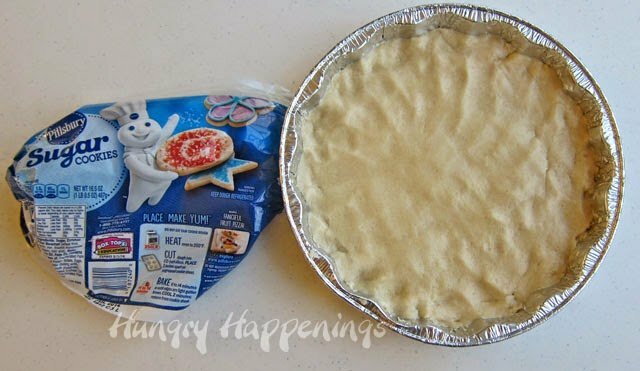 Press cookie dough into pan. Bake at 350 degrees F for 25-30 minutes until golden brown and the center is cooked through. Cool completely, then remove from pan. As you can see from the picture above, the center sunk quite a bit, which is fine. Just spread half of the frosting over the center of the cookie cookie. That will make the cookie nearly flat. Next, in order to give your cookie stone a rock like appearance, you’ll need to heat the remaining frosting in the microwave for 10-15 seconds, until it’s easy to pour. 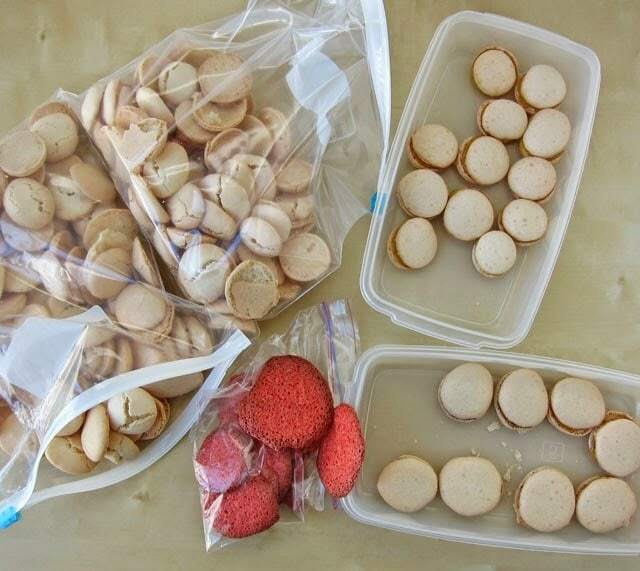 If you heat the frosting directly in the plastic tub, be sure to completely remove the foil seal, pealing off even the tiniest pieces from the edge of the tub. 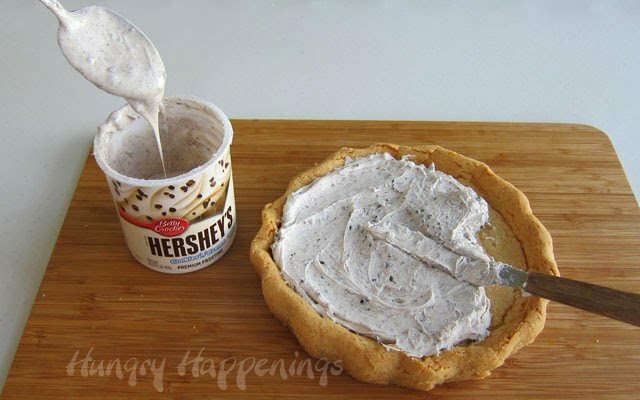 Pour the frosting over the cookie and spread it out to completely cover the top of the cookie. While the frosting is still wet. add your candy decorations. 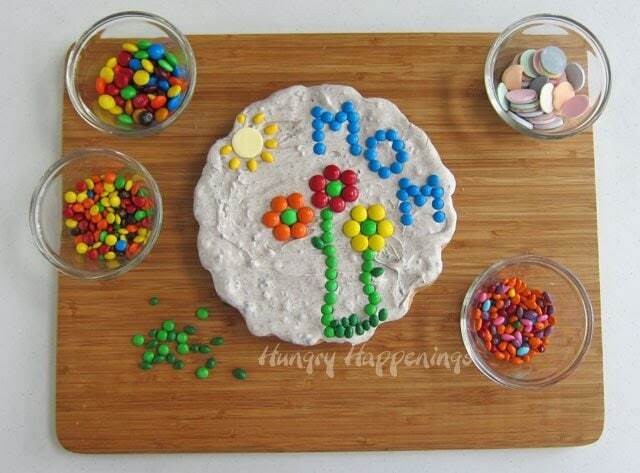 I used M&M’s in both regular size and minis, candy coated chocolate sunflower seeds, and one yellow NECCO wafer. 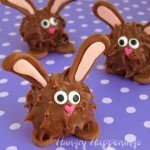 You can use any candies you like and create any type of design. 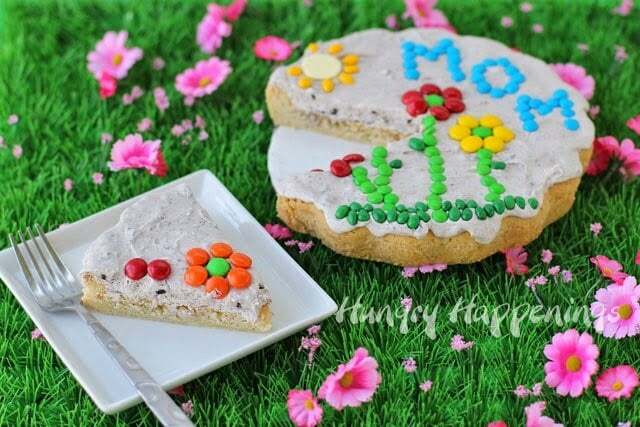 Jumbo sugar cookie decorated with cookies 'n cream frosting and decorated with candies to look like a garden stone. Press cookie dough into an 8-10 inch round pan. 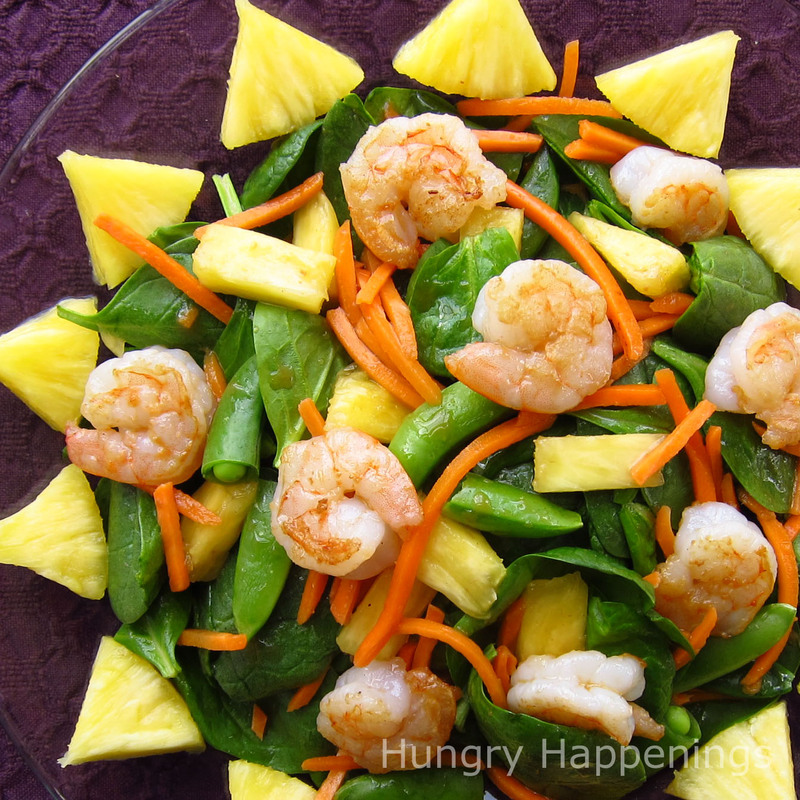 Bake at 350 degrees F for 25-30 minutes until golden brown and the center is cooked through. Cool completely, then remove from pan. Spread half of the frosting over the cookie. Heat the remaining frosting in the microwave for 10-15 seconds, until fluid. Pour over frosted cookie and smooth out. 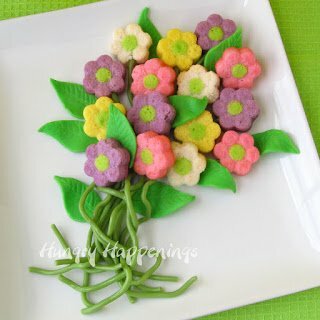 Decorate with candies to look like a garden stone. Your mom deserves the world and she has earned lots and lots of treats. So check out some more Mother’s Day Recipes and let her relax in a pool of desserts. I always love how you make edible stones – they would go perfect in my edible flower garden! You know it's the only kind of flowers I can grow! Love it! Nope, I don't think your being rude at all. I do realize I'm quite an experienced baker, and macarons have been a total pain in my *ss. We were so determined to get them right, but after 5 batches, I just couldn't make any more. It's amazing to me that such a little simple looking cookie like a macaron can be so much trouble! Thanks for stopping by. I love making projects for Mother's Day that can be done by kids and dad. 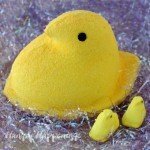 This really is such an easy project even for little hands. What a clever idea. You make everything look so fabulous. 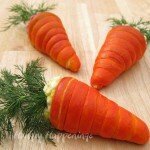 I would hate to eat them. lol! Thanks, I did have a lovely weekend. We actually had two beautiful days, so I spent lots of time outside working on my garden. This is fabulous! 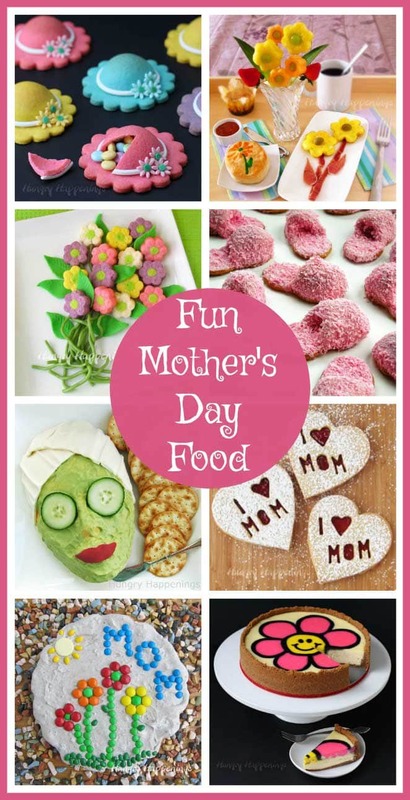 What a great way to involve kids in honoring mothers and grandmothers! 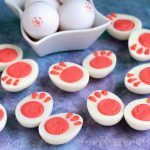 These cookies are a perfect project for little hands. I love that kids can be as creative as they's like when decorating their own stones. I know it's already official..but I'm just saying, (macarons or not) You're Awesome! These are just fantastic and so colorful! Happy Mother's Day! I thought it was a real stone too! So now I have to search for a real stone craft to put in our preschool garden.